Q6 What is a "varies" bar? Bars that very in only one bend dimension can be easily described as "varies" bars instead of describing each bar individually. Consider the vertical reinforcement in an abutment wall with a sloping top. Every vertical bar along the face of the wall is a Type 54 (there is 9 in all) and each bar has a different length ranging from 8''-0" to 10''-0" (U dimension). An alternative bar configuration would be to use 9 bars, with 3 bars at each length (3@8ft, 3@9ft, and 3@10ft). In this case enter 3 in the No. Each field because there are three bars at each length. Q5 How can I add a bar that doesn''t match any of the predefined bend diagrams? Bend Type 90 - 99 are used for special bends. In the U field code the total length of one bar. Barlist will use this dimension, along with the bar size and quantity to compute the reinforcing steel quantity. All other input fields are ignored for calculation purposes. It is customary practice to include a schematic bend diagram on your barlist sheets for Type 90-99 bends. Often the schematic will need to include dimensions that will have corresponding values in the barlist table. You can use any of the dimension fields except for U. The values you input in these dimension fields will simply be copied to the barlist sheet. 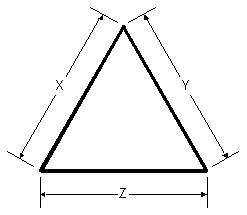 As an example, consider the bend diagram in the figure below. Barlist has no idea how to compute the length of this bar because it is not a standard shape. Therefore, you have to compute the length yourself and input it in the U field. In general, having a dimension of U on the bend diagram, representing the total bar length, does not make much sense. This is why the value you input for U is not shown on the barlist sheet. The dimensions X, Y, and Z are shown, and values are input into these fields, so that the bar can be bent into the proper shape. Q4 What is the Use parameter used for? What does Longitudinal, Transverse, and Seismic mean? A4 The Use parameter indicates how a reinforcing bar is used. Per LRFD 5.10.2 different uses require different bend and hook dimensions. LRFD 5.10.2.1a and 510.2.1b specify permissible hook types and dimensions for longitudinal and transverse reinforcement. LRFD 5.10.2.2 specifies permissible hook types and dimensions for transverse bars used in plastic hinging regions of members (i.e. Use = Seismic). Minimum bend diameters are specified in LRFD 5.10.2.3. Barlist interpertes Longitudinal as General and Transverse and Seismic as Stirrups and Ties in Table 5.10.2.3-1. Q3 What is a collaboration project? A3 Occasionally, several engineers will be working on the same bridge design project. Each engineer will be responsible for a portion of the barlist. When final quantity estimates are needed for the bridge, all of the barlists must be brought together and their individual quantities categorized and totaled. Version 4 of barlist introduced a collaboration management project for just this situation. The barlist from several engineers can be easily brought together into one barlist for quantity estimation and generation of the barlist drawing. Q2 What is the best way to set up a collaboration project? A2 When Barlist merges the individual files of a collaboration project together, it maintains the group ordering from each file. That is, if File 1 as groups Pier 1 and Pier 4 and File 2 has groups Pier 2 and Pier 3, Barlist will order the groups Pier 1, Pier 4, Pier 2, Pier 3. If the file order where changed the groups would appear as Pier 2, Pier 3, Pier 1, Pier 4. Barlist does not have a means to individually re-order the groups in a collaboration project. To get the most flexibility for group ordering in collaboration projects, put each group in a seperate file. Q1 How do I create a bar list contract drawing using Barlist Version 4.0?